Located less than two hours east of Houston, our home port of Orange sits on the banks of the Sabine River serving up a unique blend of East Texas/Cajun culture and cuisine. Bathed in the beauty of centuries old Spanish oak and cypress, this fisherman's paradise is the jewel of the most prolific marine ecosystem on the Texas/Louisiana coast. The ever changing tidal marshes are home, not only to fresh and saltwater fish, but also to a vast array of waterfowl and wildlife alike. While the incomparable trout, redfish, and flounder fishing in Sabine Lake is less than a fifteen minute boat ride down river, it's the river itself that guarantees few days lost to weather. Born and raised in Orange, I have hunted and fished this diverse system since 1959. 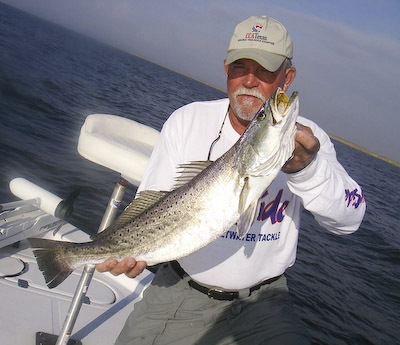 For more than 31 years, I've fished this magnificent area with hundreds of satisfied clients. We look forward to sharing a day with you! Now thanks to the efforts of the CCA, our fishing has only improved, and satisfied customers agree, "She's only getting better!" To find out more, use our contact form or call (409) 883-0723.